The Monster Time Trial is a race organized in the town of Fleveopolder, Netherlands. At 122.5km (75.6 miles) the name is well deserved. It takes a special type of rider to target this event. Remco Grasman is just such a rider. 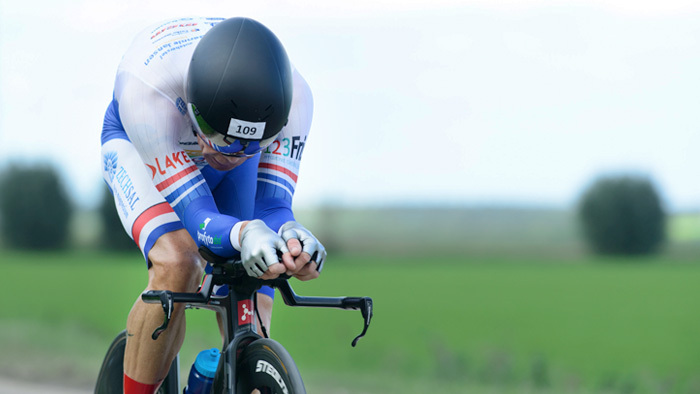 A time trial specialist, he won the race last year in a course record time of 2:39:57, which equals an average speed of 45.97km/h (28.5mph). Working with Remco this year, we aimed for the goal of a new course record. To accomplish this, we knew that not only a perfect preparation and fitness was needed, but also ideal conditions with no rain and not much wind were essential. After a terrible crash at the end of June, Remco was back on his bike in the middle of July. From that day on, the goal of the rest of this season was the Monster Time Trial. In the 10 weeks left the goal was to built as much aerobic power as possible. One week before the race his Functional Threshold Power (FTP) was between 375 and 380 watts at a heart rate of 165bpm. While FTP is the power that can be maintained in a steady race for an hour, we knew this race will be longer. For a course record, Remco would be pedaling for at least 2:39. In the book I wrote ( www.thesecretofcycling.com ) I used a famous model from Peter Riegel, designed for running speed. With this model, I calculated that the power for 2:39 must be 93 percent of FTP. For Remco, that would be 350 watts, a realistic power output. Using Best Bike Split, I calculated what speed and time he would ride that day, according to the latest weather updates. One lap with an average of 350 watt would give a lap time of 53:36. So 3 laps would result in 2:40:48. I calculated that in order to set a new course record he would need to ride about 5 to 6 watts higher, or 355 watts. Remco started faster than was planned as he wanted to get an advantage in the beginning of the race, and his biggest competitor started 2 minutes before him. This resulted in a 370 Normalized Power watt average and a laptime of 52:25. His average heart rate was good with an average of 158bpm. The second lap was even faster. The power was a little less than the first lap at 359 Normalized watts, but the lap time was 52:18 at an average heart rate of 153bpm. As expected, Remco began to struggle on the third lap. Struggling to keep putting out power, he still managed to hold an NP of 336 watts at an average heart rate of 147bpm. View Grasman’s full power file. Remco’s effort resulted in a new course record of 2:38:04, which was 1:53 faster than his record setting performance from last year. Additionally, at an overall NP of 356 watts, the Best Bike Split plan was was within 1 percent of his time. In 2003, Guido Vroemen founded SMA Central Netherlands, a training and testing center for endurance athletes. Dr. Vroemen is the team doctor for team Roompot-Charles (pro-Continental Cycling team), and coaches other top cyclists and triathletes. He has an M.Sc. in Medical Biology and a Dr. in Sports Medicine and Exercise Physiology.